Please excuse our dust! 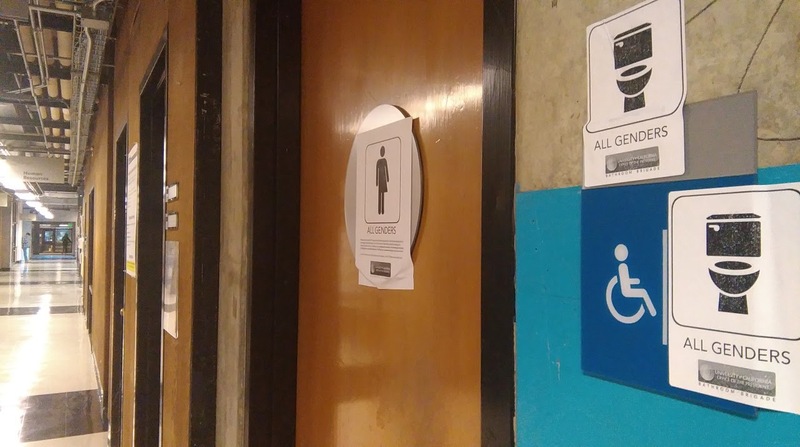 The approval and planning process for a bathroom redesignation is surprisingly time-consuming, but in the interim the University’s priority is making sure everyone has safe access to a bathroom. As a temporary measure, we encourage everyone, of all genders, to use this bathroom. We’ll put up a permanent sign as soon as we can. In a tongue-in-cheek way, the signs seek to pass as being officially authorized. They also highlight the reality that trans and gender nonconforming people on campus do not have adequate access to safe bathrooms. University administrators appeared to have recognized this unmet safety need: months ago, President Napolitano promised to redesignate every single-user bathroom as “all gender,” while UC labor relations agreed to provide reasonable access to all gender restrooms for student workers. Since then though, UC Berkeley administrators have not redesignated a single bathroom. Signs have appeared on the building’s restroom doors that indicate that restrooms are available to all genders. Please disregard the signs; they will be taken down as soon as possible. Still trying to collect my memories from the heat of the moment, but moments ago I stood in front of this sign to stop a man from aggressively tearing it down as we went to the bathroom after class. He had torn down 3 of 4 signs despite repeated requests to stop, and was so determined to get the last one that he attempted to pull it from behind my head. My friends and a passerby were shocked by how he went so far as to almost touch/hit me to get to that sign (which he may have, but I was too focused on protecting the sign to notice). There is a photo of me pointing my camera phone to get him to back off, since he stood incredibly close. All of this occurred even after I explained that the folks behind this campaign are trying to force the UC to take issues of gender and trans safety seriously. He and his friend are both older white men who likely work in the electrical engineering and computer science admin office, so we were surprised that they felt so comfortable proceeding aggressively in a confrontational dispute with students. But their behavior is a perfect example for why the UC needs to stop dragging their heels in implementing accessible gender neutral bathrooms. Then, early yesterday afternoon, two students were detained by the UC Police in connection with the bathroom redesignations. A white trans woman and a black cis man, both members of the Bathroom Brigade, were initially confronted by two building administrators in the hallway of the Li Ka Shing Center – a building that currently contains no all gender restrooms. One of the administrators demanded that “all gender” signs be removed, which the students attempted to do. When the administrator continued harassing the students, they left the building and walked three blocks to a bus stop. He followed them the entire way, talking on his phone as he walked. The students then boarded a bus and rode on it for a block, at which point the bus was stopped by two UC Police officers. The officers came onto the bus and detained the students. After detaining them on the sidewalk, the officers said that they were planning to report the students to the Office of Student Conduct, and that, if there had been any damage to paint surfaces in the Li Ka Shing Center, they would consider pursuing a warrant for the students’ arrest. That two students attempting to expand trans peoples’ access to safe bathrooms were harassed, followed, and detained by the UC Police highlights some of the connections between interrelated forms of sanctioned violence: the harassment trans people face in public spaces, including at our universities; the securitization of partially-privatized UC buildings, such as the Li Ka Shing Center; and the militarization of UC and Berkeley City police departments. A coalition of student and community groups has recently been pushing back against police violence in Berkeley. On February 10, the UCB Black Student Union helped organize a march to city council, where students and community members called on the council to take action against racial profiling and against militarized policing throughout Berkeley. The coalition also continued to press for justice for Kayla Moore, a black trans woman who was killed in her home by Berkeley City Police on February 13, 2013. Please take a moment to call or email Chancellor Dirks and share with him your thoughts about what happened today. You might consider demanding: 1) that UC Berkeley expedite the process of redesignating bathrooms as “all gender” in order to address the safety needs of trans and gender nonconforming people; and 2) that no student conduct or legal charges be brought against students for posting “all gender” restroom signs. Chancellor Dirks: (510) 642-7464; chancellor@berkeley.edu. The campus is working on a plan to create more All Gender bathrooms on campus and have some already in place. For a list of gender-inclusive and single-stall bathroom locations on the central campus of UC Berkeley, please go to http://geneq.berkeley.edu/restrooms. to anonymous: what students concerned about this would like to see is the campus move from "working on a plan to create more All Gender bathrooms" to a situation where the campus simply "create[d] more All Gender bathrooms." the plan has been in place since the beginning of the fall term, while there has up to now been little to no tangible progress affecting the lives of trans students and workers. those who are working on this in the administration can expect that until redesignations are actually made, students will ensure through their actions that administrators continue to feel the urgency of the situation.